As someone who craves organization, I thought the best I could ever do with my board games was baggies, Plano boxes, and Hugo's Amazing Tape. Then I stumbled onto the website of The Esoteric Order of Gamers and everything changed. 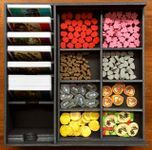 Not only does this site contain the wonderful rules summaries created by UniversalHead, there were also several videos on how to build your own custom foam board inserts. After purchasing the necessary supplies, I decided to give it a try. After some initial frustration, I slowly began to improve. By the end of my first insert, I was hooked! Here is my list of supplies: Elmer's Foam Board, a utility knife with breakaway blades, a 12 inch metal ruler with millimeter measurements, a self-healing cutting mat, tacky glue, sewing pins, a crafting knife to remove excess glue, and a hot knife for cutting curves & circles (using a stencil). A pencil & paper is also handy for writing down and/or marking measurements. 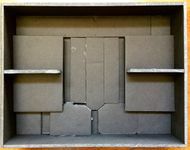 Below is a list of all the foam board inserts I've created, in chronological order, along with pictures, some details on the process, and lessons learned with each one. My primary reason for creating an insert is to fit a base game and it's expansions into a single box, in an organized fashion. Other times, I'll choose to build one if there are bits used frequently during play that would benefit from some organization. 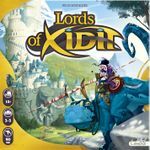 Foam core insert modifications - The unofficial home for all foam board inserts on BGG. If you've created an insert, feel free to add to this list. I was glad to finally receive the Babel expansion for Christmas as it gave me a chance to finally redo my very first insert. I wasn't even sure it was possible to keep 7 Wonders with all of it's expansions in a single box until I saw colinmarsh do it so a big thank you to him! Another thank you to mauigreen for creating dividers for all the 7 Wonders cards. The first big change was using those dividers to keep all the cards together. That saves a lot of space. Also updated in this version, I've kept all the Wonder boards together as there was really no need to keep them separated based on expansion. I realized early on that I wanted removable trays for the combat tokens, money, and debt. I also wanted a removable tray that only contained the tokens used in the Great Projects module. For the bottom level, you have all the cards, divided by Age and expansion, the Babel tiles, and Great Projects cards. After I made sure I could build a tray for all of the GP tokens with the same measurement as the cards, I used the remaining space on the bottom next to them for some miscellaneous tokens. The middle level contains the GP tokens tray, combat tokens, and debt tokens. 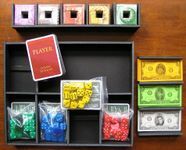 The top level contains the boards and a large money tray, making it easy for everyone to get at during the game. Overall, I'm very happy with how this insert turned out. If another expansion comes out, I'm not sure how much more I could fit. There's room for more cards and I could probably make the money tray smaller but that's about it. 1. The most important thing is to use a sharp knife. Change the blade when the cuts don't feel smooth anymore. 2. The bases of the levels are the most difficult part of the cutting process (at least to me). It's the first thing you'll do and most important. You don't want to mess it up because it uses the most foam board. Measure accurately and give yourself several millimeters on all sides so the levels can easily slide in and out. 3. Whenever I do an insert with lots of pieces, I also start with the bigger pieces since there is usually only a few places they can go. Once you have that, you can build the smaller pieces around them. Having an idea of which pieces you'd like to keep together is also helpful. 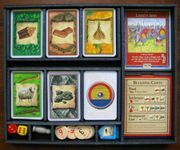 The next insert I created was for one of my favorite games, Kingdom Builder. 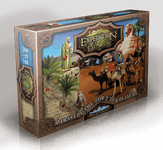 The top level contains all the pieces for the base game, Nomads expansion, Crossroads expansion, and the Caves & Capitals promos. The bottom level contains all the boards. This is one of my most organized and functional inserts. I'm very happy with how it turned out. The location tiles are stored underneath the card/stone holder. The bottom row is the base game, the middle row is for Nomads, and top row is for Crossroads. You'll notice that most of the tiles are in pairs. This was done so that I had room for my fingers to pull out tiles. I experimented with giving each tile it's own space, but it was just too tight. As for the card/stone holder, it works great for using in-game. I just put the unused red cards back in the box and use that spot for a terrain card discard pile. Originally, there was a wall on one side of the cards, but soon found I couldn't fit the cards! I actually prefer it like this as players can pull from either side. I have to say, I can't imagine playing this game with the expansions and not having some way to keep everything organized. It really speeds up setup and breakdown. 1. You can design the most functional and organized insert imaginable, but sometimes, nothing beats a baggie. Originally, the settlements just sat in their sections. It looked great but was not functional. It took players quite some time to maneuver all the little houses out of their sections. Now, I just throw them their baggie and we're on our way. 2. This greatly depends on the game and how much you enjoy it, but sometimes it doesn't hurt to leave room for the future. When designing this insert, I specifically made sure to leave room for the Crossroads expansion. An empty row, the excess space around the stones and 1st player marker, all of it designed on purpose to leave room for Crossroads expansion pieces. My next insert, and also one of my favorite, was for King of Tokyo. There is absolutely no good way to fit the base game and Power Up expansion in the original box with the original insert. Before building an insert, I stored the evolution cards under the base game insert, all wrapped together. Obviously, that's not going to be good enough. Regarding the top level, the left section can be taken out and used during play. I experimented with creating something to hold the cards that could also be taken out and used during play, but it became more trouble than it was worth. The middle and bottom levels are identical. I only have seven monsters so there is room for one more, if needed. However, I don't get to play this game as much as I want so I don't see myself purchasing any additional expansions. 1. 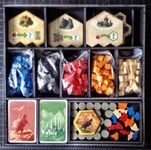 Ok, so I actually learned this lesson with Kingdom Builder, but I can't stress enough that the great thing about building inserts is not only how they can keep your pieces organized in the box, inserts can also be just as useful outside of the box. 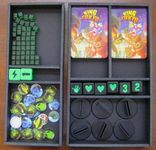 Seen here, all the energy crystals, bonus dice, and various card tokens stay organized. I toyed with creating sections for each card token but found that it really hurt things more than helped. 2. Once you've built the outer shell, most times you'll find it's best to build the inside as you go. Note the four walls in the center of the insert that make up the square in the center. Since the length of each one relies on where the previous one was glued, measuring them all at once and then trying to fit each each one into a specific place would have been quite time-consuming. It was far easier to simply glue one section, measure, glue another, etc. You should have a general plan when building these things to make sure everything will fit, but a lot of the specifics can come later. 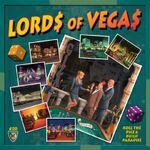 Someone on BGG came up with the perfect quote for the insert included with Lords of Vegas. It went something like, "this is a great insert...too bad it's for another game". So true. Originally, I was using a small organizer I found at Lowe's for all places and it worked ok. But I knew I could do something better. Specifically, I wanted something that could store the building pieces and be used during play to keep them all organized. Here is the result. The money can also be taken out and used during play, but let's be honest, we're all using poker chips, right? In the second picture, you'll see pieces of foam board under the card deck and player pieces. I learned this lesson a bit late, I'm afraid, but adding a small piece of foam board under cards makes them much easier to take out. The Lords of Waterdeep insert does something like this and it works well. 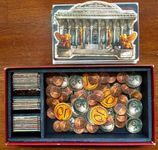 I wish I had done this with my 7 Wonders insert and I will probably go back and add them at some point. 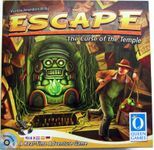 The Escape box could easily fit the base game and Illusion expansion but it was a real mess. My goal here was simply to organize it. 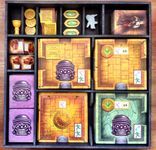 This top level contains all the player pieces, jewels, and temple pieces required for every game. When I purchased the Quest expansion, I decided to do a minor update to the bottom level of this insert. Specifically, I've added some walls to the top to segregate all the various quest items. I also reorganized the chamber tiles a bit. The top level now contains only the 6 main chamber tiles needed for every game. The bottom level is split into 4 sections. One section has all 13 basic chamber tiles. One section is all 13 treasure/curses tiles. The bottom right section is all the Illusions tiles. Finally, the bottom left contains all the Quest tiles and the Pit promo tile. There is also labels under the spots where the tiles go so I can remember which tiles go where. 1. Maybe the lesson here is too much space can sometimes be a bad thing. I struggled for quite some time coming up with a design that would utilize space efficiently and stay organized. I guess I got it half-right. 2. As I mentioned in the beginning, a lot of what I learned came from the three videos on The Esoteric Order of Gamers website that show you how to build inserts. One great tip they mentioned was building little half-walls when space is tight. You'll notice them in between the temple tiles. The walls could be straight but really look nice when cut at an angle (and very easy to do). 3. When you have an insert that has many spaces which each contain similar components, it may be a good idea to label the spaces. For this insert, I used a standard label maker to notate how many tiles are in each spot and what type of tiles they are. I find this to be very helpful when you are trying to keep components of a base game and it's expansions separate. 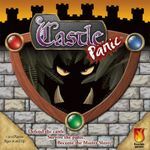 It's especially useful for a game like Escape where you have many interchangeable modules. I won this game in an auction and was surprised to see that it contained no insert of any kind. The box top was "dishing" a little bit and the lack of an insert probably wasn't helping. This is a pretty straight-forward one-level insert. 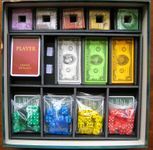 The money holder comes out and can be used during the game. Under the money holder are the pieces for each player. Also, those horse cards barely fit at the top so I was quite lucky. 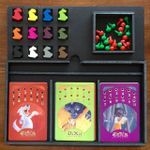 Ok, so I learned this lesson way back on King of Tokyo, but I thought I would mention it here because I think it's so important. Put everything a player needs in one place. 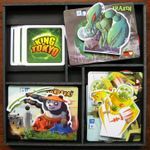 In King of Tokyo, you'll notice that each player's board, monster, and evolution cards are all together so they can easily grab them and put them away. The same thing is seen here for Winner's Circle. This is something I will always try and do, if possible. It really accelerates game setup and breakdown. This was one of the most difficult inserts I'd attempted so far. 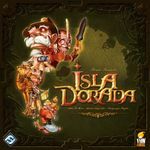 And fitting that it was for the first game that got me into the board game hobby. Without all the lessons learned from my previous inserts, I doubt this would have come together. Originally, I had the grand notion of putting all my Catan stuff into a single box. Once I got down to measuring, I soon found that wasn't going to be possible. 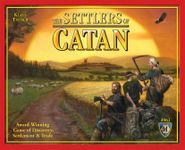 Instead, here is the top and middle level of the insert contained in the Catan base game box. The top level holds all the tiles, borders, and player tokens for the base game. The middle level holds the cards, dice, robber, number tokens, port tokens, player aids, and Largest Army/Longest Road boards. 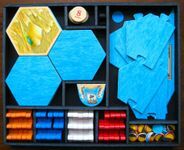 The bottom level of the Catan insert is for the 5-6 Player Extension. Originally, I wanted to fit all six players on one level but it just wouldn't fit. That leaves plenty of room for all the extension pieces in this level. Although I didn't picture it, underneath those development and resource cars is a label I made that says exactly how many of each of those cards there are. This way, when you're putting the game away, you'll know exactly what to return to the extension insert. Much better than looking at the components page in the instructions every time. 1. I learned this one when designing Kingdom Builder but it bears repeating: Leave room for your fingers. You'll notice that the card holders can be removed and used during play. This was a "had to have" for this game as I hated how messy the card stacks got. I made sure to leave plenty of room between the two card holders so you could easily remove them. If you look at all the pieces contained in this level, you'll notice I've left room to get them out. 2. You'll notice that the border additions, player aids, and instructions are all just thrown into a single spot. I probably could have designed a specific place for them but sometimes functional is better than pretty. I really wanted to keep the instructions for the extension in this insert and this was the best way to do it. 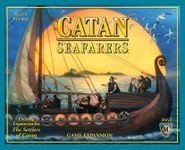 The top level for the Catan Seafarers insert was very tricky and took a lot of planning. There is a space for the tiles, number tokens, port tokens, pirate ship, border pieces, catan chits, and player ships. 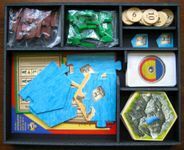 The middle level for the Catan Seafarers insert holds everything needed for the 5-6 player extension. Nothing too crazy here. There was plenty of room to fit everything. And finally, the bottom level for my Seafarers extension. I know, that's Cities and Knights, not Seafarers. I love Cities & Knights but I know I'll never play it with more than four people. 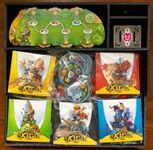 So I made another tough decision and tossed the C&K box completely because all the components easily fit in the Seafarers box. This also frees up more space in the board game closet. As with the base game, the card holder inserts can be removed and used during the game. 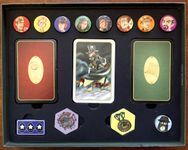 Underneath the card inserts you'll find the pirate board and individual player pieces. 1. You'll notice walls going in all sorts of directions to make everything fit and stay organized. I definitely got a little lucky as sometimes you just don't know how it will work out until you start gluing things together. The lesson here is don't be afraid to make use of all available space. 2. 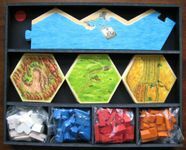 One of my biggest problems whenever I would play Catan with any of the expansions or extensions was how long it took to separate everything back out when we were done. We'd always have to go to the components list and count out everything to make sure we got it right. This was a huge pain. There had to be a better way. After much thought and soul-searching, I decided the best solution for me was to put stickers on the game components! I know it's crazy, but here me out. 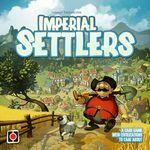 You'll notice that in some of the pictures for my Catan inserts are colored stickers. There is a different color for the base game, 5-6 player extension, seafarers, and 5-6 seafarers extension. Any similar components will have stickers on the back. So things like borders, terrain tiles, number tokens, and port tokens. When it's time to put everything away, just match the colors with the insert level. It works very well and really speeds up breakdown. 3. 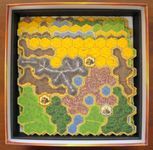 When I began to build my Catan insert, I noticed that a lot of the walls I would need were similar lengths and heights. So, I cut something like 15 walls of the same size and adjusted them as needed when putting them together. It's much easier & faster to slightly shorten a wall than it is to completely cut out new ones each time. To summarize, cut many pieces to one size and adjust as needed. After getting the expansion, I decided to redo this insert and organize the different characters in a way that would get games going quickly. According to the rules, you always want a certain percentage of characters that generate money in every game so I divided them into one group. The second group are people that steal money from others. The third group is essentially everyone else. In addition, I have stickers on the backs of some of the character tokens indicating the minimum number of players needed for it, as outlined in the instructions. Finally, I taped a label inside the box top reminding me which characters belong in which group so that I can quickly pack up when done. I also combined all the money into one pile. Don't be afraid to redo an insert if the need arises. For example, if an expansion is released or you learn a new technique that you think might improve your original. 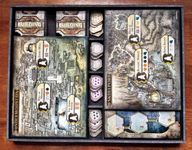 From someone who appreciates "a place for everything, and everything in it's place", the original insert for Lords of Waterdeep is close to perfection. But once the expansion came out, I had to decide if I really wanted two boxes taking up space on my shelves. Also, one issue I've always had with the existing insert is how long it takes to put everything away. Specifically, the jewels, coins, and player building markers have to be oriented in the same direction to fit in their slots. This takes time and is quite annoying. Finally, I've mentioned before that I prefer to have everything a player needs all in one container. The current insert divided everything up. For all of those reasons, I decided making my own insert was a good idea. 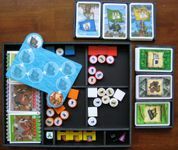 The top level for the LoW insert contains everything for the base game. Underneath the player mats are all the pieces for each player. This really speeds up setup and breakdown. For the DnDeeples container, I made sure to leave one wall exposed so people could see how many were left while playing. I also have containers for the coins and VP jewels. Originally, I was going to have a larger container for the coins that was to be built under the DnDeeples container. It turned out there wasn't enough space. Instead, I used the original VP jewel container for the coins and built a second container for the jewels that sits on top of the buildings. 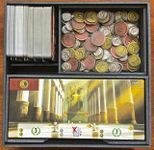 I would have liked a larger container for the coins but it doesn't really matter all that much because I actually use metals coins when I play instead of the included cardboard coins. The bottom level contains everything for the expansion and really doesn't take up much space at all. The left side is Undermountain and the right side is Skullport. The middle is for the additional adventurer markers and can be used with either expansion. If you look closely, you'll notice the wall configuration for each expansion module is slightly different. Part of me wishes I would have made them look identical, however the Undermountain expansion just doesn't take up as much space. So I instead decided to make the card sections a bit bigger for Undermountain and left an open section on the bottom left. 1. Here is a simple tip that I probably should have put higher in the list. When making cuts, especially long cuts, it's usually better to make a light cut first and then go over it again with more pressure. In other words, don't try and make the long cuts all in one pass. I've found it much easier to make 2 or 3 passes instead. If you watch the videos on the Order of Gamers website, they mention this as well and show you what I'm talking about. 2. When designing sections that will house cards, my personal preference is to make them a bit longer or wider so you have room to get the cards out. The alternative is to leave an open section on one of the walls (as I did with the Skullport cards). This will work when space is limited, but it takes a little longer to build and is not as easy to remove the cards as the first method. It sure does look neat, though! This is one of the tougher ones I've done and I still can't believe I got everything in one box. Previously, I used a small plastic container to hold all the various animals and resources. With the first expansion, everything barely fit. 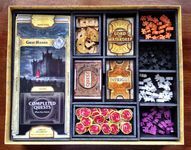 Once I got the second expansion, I had to ditch the container and build a custom insert. The left section contains both Buildings expansions, farmer meeples (sold separately), and a dry erase marker (I use a laminated score sheet instead of the score pad). The right section holds the farm expansions. Underneath them you'll find the following: fence pieces, feeding stalls, first player marker, resource & animal chits, all the starting buildings, and finally, my dry erase pen. 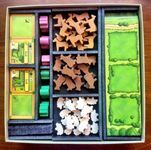 The top of the middle level contains the horse, sheep, and cow meeples. Underneath that you've find the pig meeples and resource meeples (sold separately). Measure, measure, and measure again before you start cutting and gluing, especially when space is going to be tight! The middle was the hardest part, by far. It was the last section I built and I wasn't quite sure everything would fit. I went through several rough drafts and lots of trial and error before I found a way to make everything fit without sacrificing organization & functionality. I wasted a fair amount of time and foam board. Luckily, the pieces weren't that big. After the difficult jigsaw puzzle that was Agricola ACBAS, it was nice to work on a relatively easy one this time. My goal here was to get the game set up as quickly as possible. And since there was plenty of space to work with, I had a lot of options to choose from. The bottom level of this insert contains everything for the expansion. The exception is the flame tokens. I decided to keep them in the top level with the other small tokens because room was available and to facilitate faster game setup. Fun Fact: The walls for this insert are only 10mm high! That means this entire expansion only takes up 15mm. That left plenty of room for the base game foam board insert. Because the game board was smaller than the game box itself, I used the extra space to build a removable insert on the top level for various items used during the game. It's also nice because it keeps the board from shifting around. For the bottom level, I made a removable insert for the arrows. Because I had so much room to play with on this one, I decided to build several card trays. Specifically, I built two 7 slot trays, split into 2 pieces each. The first tray is for the 6 public destinations and draw deck. 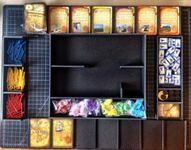 The second tray is for the 6 events/explorers and another draw deck. The advantage of these trays is you can quickly see if a card is missing. Also, I've found that when you have a lot of stuff on the table, it can sometimes be tricky to grab a single card. A tray raises them off the table just a bit so that anyone at the table can easily take one. I wouldn't recommend making these for every game though, as it takes a bit of time to measure everything out and cutting the thin dividers can be a challenge if you're blade isn't extremely sharp. A very simple and probably unnecessary insert for Blueprints. The good news is, because it was such a small box with only a few components, it didn't take long to make this. While not pictured, the score-tracker, player screens, cloth bag, and instructions sit on top of everything. Also not pictured, I cut out the original Blueprints insert so that it fits on top of the cards (no real reason, I just thought it looked nice). Ok, so this game already comes with a pretty good insert. Even when you buy the 1910 expansion, it's still possible to nicely fit everything in the box. I decided to build this insert for two reasons. First, my mother-in-law purchased a used copy of this game from a friend of mine and for some crazy reason he threw out the insert and bagged everything. To make things easier for her, I gave her my insert. Second, I've always felt that this game could benefit from a card-holder to use during play (see picture). The borders between the five individual cards are only 5mm high by 5mm wide. Then, I have larger borders to separate the draw, discard, and Destination Ticket pile. I've found that by elevating the cards off the table a bit, it's much easier for players around a table to grab one without bending them. 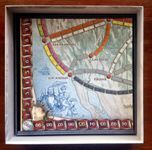 The top level of this insert contains the train & destination cards from the 1910 expansion as well as the card-holder (in two pieces). The second level contains the trains. The bottom level is for the board and fits quite nicely. Since I have no use for the original smaller cards, I don't store them with the game. If you need to cut very small sections, a 5mm border for example, it's much easier to cut them off of a larger piece of foam board then a smaller one. I've noticed that when I try to cut them off a small piece of foam board, it's difficult to keep the knife from pulling the foam board down, even with a ruler sitting on it. 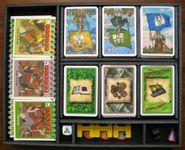 This insert was actually made using the box for Asante, the unofficial third expansion for Jambo. I created it to hold both Jambo and Asante. 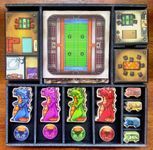 However, I've left room for the 2 small Jambo expansions, if by some miracle I can ever find them for less than $30 each. As you can see, the gold and goods trays can be removed for use during play. I decided to keep the action tokens from Jambo and Asante so players could have their own. Whenever I design resource trays, I try to consider how often players will need to grab stuff and put stuff back. If they are mostly taking stuff out, the trays can be more snug to their resources. 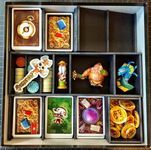 For a game like Jambo where you are constantly removing and adding resources, I made the trays much larger so it's easier to put things back in the tray. This insert design was was like putting a puzzle together without knowing the shape of all the pieces. 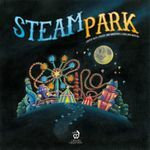 Steam Park's included insert was a good starting point since it was designed to keep all the rides together on one side. That left a little more than half the box available for everything else. I also knew that I wanted a tray for all the stands because it's important to see how many of each type are remaining. After confirming that the rest of the larger components would fit around it, I built the stands tray. Everything else revolves around the dimensions of this stands tray. After making space for the dice, cards, pigs, player aids, and starting boards, the locations of rest of the components (extension boards, dirt tokens, money, and visitors) were decided on last. I basically had a pre-determined amount of space left to use and was left to figure out how to design the rest of the trays based on that space. In other words, they weren't planned out ahead of time. As you can see, the money tray sits on all the rectangular components. The visitor tray sits on the stands tray. 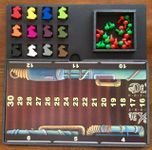 The extension board tray sits on the cards, which sit on the dice. Finally, the two dirt trays sit on the starting boards which sit on the player aids and pigs. I found it very helpful to measure the components with fixed sizes and combine them whenever possible. For example, the dice (when lined up in four rows) are exactly the same size as the cards, which are almost identical in size to the extension boards. Things like the visitors, money, and dirt tokens could be built to fit whatever space I had remaining. This game really doesn't have a lot of pieces but it does have five different decks of cards, four of which are used during the game. There is also a discard pile and four cards displayed at all times. 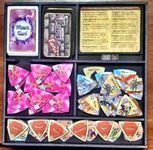 My purpose with this insert was to simply keep all the different decks better organized in the box and on the table. And since you only ever lose money, building the coin container with the decks makes it easy for people to throw their money in when using them. If you look closely at the expedition totem and ocean tokens, you'll notice they are raised up in relation to the pieces around them. This is easily acheived by creating a small two-legged table underneath them with the legs set to the desired height. This simple technique is very handy and makes smaller pieces easier to reach. It looks nice too! Nothing too crazy going on with this one. As you can see in the bottom level of this insert, the cards come out along with a small box to put broken teeth & meeples in during play. 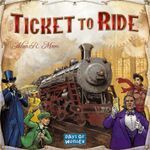 Now we don't need to keep the game box on the table during play. I also decided to keep the meeples bagged. Eventually, I would like to get a cloth bag so you can pull meeples out without seeing them during setup. The main reason I made this insert was for the foam board square you see around the monster screen. There is one for each monster and it holds the screen in place with small borders. In my first couple of plays, I found that you frequently needed to move your player shield around as other players would need to shift around the table. It was tricky to do this and keep all your stuff hidden. 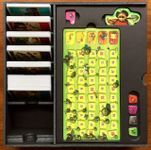 With these little foam board squares, you can easily just pick your screen up off the table with all your "loot" and everything stays hidden and organized. 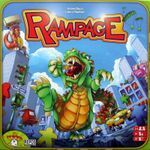 If you own Rampage, I would highly recommend making these for your player screens. This game uses six different decks of cards and individual discards for each deck. My primary motivation for this insert was to bring some order to these decks as it can get quite messy on the table. 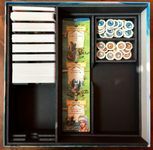 The top level of this insert contains a removable tray for all the various tokens that you'll need while playing. There is also another removable tray for the money, seperated by denomination. Finally, there are removable trays for the six different discards, one for each deck. The second level has two more removable card trays to accommodate the six decks of cards. There is also a tray for the extra rooms. This tray can be used during the game, or you can simply take all the room tiles out and stack them. It just depends on how much table space you have. The bottom level of this insert contains all the pieces that you don't need removable trays for. This was by design and I'm very happy I was able to make it work that way. We have the player boards, player pieces (I made sure to leave room for an extra hat for each player which are in the process of being delivered), the player order board (a required promo, IMO), and the extra board pieces. Underneath the player order board are a few more small pieces used during the game. I made sure to make the borders underneath at varying heights so you could easily push the player order board on one side to remove it. Underneath the extra board pieces are the Employment cards, Last Will cards, and the plan tiles, separated according to player count. Overall, I'm very pleased with how this insert came together! As with most of my inserts, I feel like the hardest part is planning where everything will go, before a single cut has ever been made. With some of my previous designs, I've noticed that once you organize the components into an insert, there is a lot of free space left in the box. If you store your games vertically, everything will basically tip over. To solve this (with Finca for example), I just made the sides very high and made two levels when one would have sufficed. For Bruges, I decided to build a "reverse" insert. Basically, build the walls underneath the insert instead of on top. I think it came out well, though it does use a bit more foam board. There is a spot for the card holders, a tray for the money & canal tokens, and another tray for the workers and threat tokens. I was going to separate the workers from the threat tokens but decided it would too hard to grab them from small containers. I think dividing by color is sufficient & attractive. Though it might be hard to tell, each of the three sections underneath the insert are at slightly different depths. I added "feet" to each section, with each section's feet a slightly different height. Together though, they extend the height of the insert equally so that it is almost flush with the top, leaving room for the board and instructions. I have to give a HUGE shout-out to Chris Whitpan as the inspiration for this design. He was the first one I noticed who built a "reverse" insert and showed that you could design something functional AND attractive. I would have probably never thought to try something like this if I didn't see him do it first. Showing the bottom of one his reverse inserts was especially helpful. Thanks Chris! For the top layer of this insert, I made two trays for the gold and adventurers. I measured the size of each one so they could simply be placed on the game board during play. I kept the walls as short as I could so people could easily grab from each of them. The second level was pretty easy. As with other inserts, I tried to keep all the things a player would need in their own bags. I decided to do the same with the 3-player components. It's been a while since I've made an insert and it shows. I made several mistakes with this one, but luckily, I was able to correct them without having to start over. One new thing I tried were the cut-outs for the smaller pieces on the top level. I simply traced the pieces and then cut along the trace line using my utility knife. Straight lines are ok, but curves were a challenge (which you can see if you look close). I'm wondering if there is a better tool I could be using for this. I tried an exacto-knife as well and it was a little better. 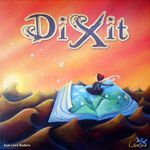 This two-level insert fits the original Dixit, Odyssey, and three more expansions. There is even room for one more! I simply pasted another piece of foam board under the top section to make the "floor" for the rabbits and tokens. To cut straight and curved lines into foam board, I've tried an x-acto and utility knife. Neither worked great. I wonder if there is a better tool out there. I'm open to suggestions. It never hurts to leave room for expansions! 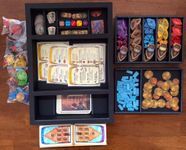 There is a lot of extra room in this box so when designing this insert, I made sure to leave plenty of room for expansions. The left side is all for cards. The dividers are currently held in using pins so I can easily move them as more cards come out. I also made a conscious decision to make the top and middle levels removable so I could change them as expansions required. The top section on the right side is a cutout tray used to hold some various components. For the part that holds the player's scorekeepers, I made sure to leave room so I can expand it as needed. 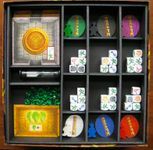 The middle level is a token tray for all the various resources. 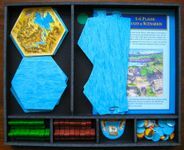 The bottom level contains player boards and a removable tray for the new Atlantean tokens. I also have four rules summary sheets that sit b/w the middle and bottom level. In a previous post, I mentioned the Foamwerks Circle Cutter. I've since decided not to recommend it. Basically, it worked one time for me and then it was useless. Instead, I purchased a hot knife from the local craft store for about $10 (costs about $12 on Amazon). This thing rocks! It has an x-acto type blade on it that heats to like 850 degrees. It cuts through foam board like butter. For this project, I used a simple stencil to trace some circles and cut out those half-circles on the card dividers in minutes. It also worked great for the cut-out tray on the right. I simply traced the components and cut along the line. The cuts are much smoother. Just make sure you cut on a glass surface as this thing will bake a cutting mat. Another "reverse" insert, this time for Mr. Jack. This box is way too big for what's inside. Based on Henning B's design, I decided I wanted to showcase the character tokens as well (as I have no interest in getting the expansion). It was easy enough to make individual slots for the other components. Very happy with how this came out. I also took a picture of the bottom, so you can get a better idea of what's involved in this style of insert. The great thing is the bottom does not need exact cuts and glue can go anywhere (since no one will see it). I used my hot knife again to take care of all the circles and component cutouts. It only took about 10 minutes to cut out the eight circles needed for the character tokens. One new trick I learned is that I could use the barrel of the hot knife to round out any rough edges made during cutting. With the circles, for example, I just quickly made a circular motion around each one to create a smooth finish. The barrel is quite hot, so make sure not to leave it still for too long or it will quickly burn through.